The Cisco® ASA 5500 Series Adaptive Security Appliance is a purpose-built platform that combines best-in-class security and VPN services for small and medium-sized business (SMB) and enterprise applications. The Cisco ASA 5500 Series enables customization for specific deployment environments and options, with special product editions for SSL/IPsec VPN, Firewall Network Security, Content Security, and Intrusion Prevention. The Cisco ASA 5500 Series SSL/IPsec VPN Edition enables organizations to gain the connectivity and cost benefits of Internet transport without compromising the integrity of corporate security policies. By converging Secure Sockets Layer (SSL) and an IP Security (IPsec) VPN service with comprehensive threat defense technologies, the Cisco VPN client delivers highly customizable network access tailored to the requirements of diverse deployment environments while providing advanced endpoint and network-level security (Figure 1). 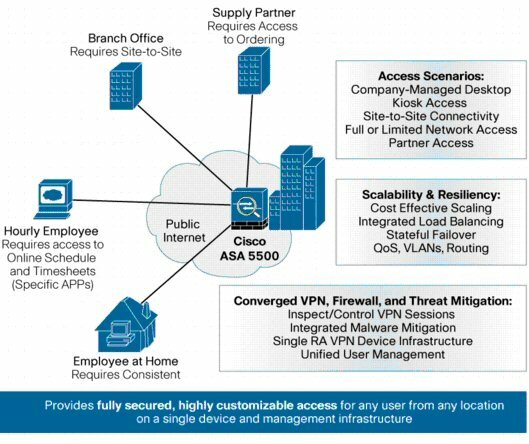 The Cisco ASA 5500 Series SSL/IPsec VPN Edition offers flexible VPN technologies for any connectivity scenario, with scalability up to 5000 concurrent users per device. It provides easy-to-manage, full-tunnel network access through SSL, Datagram Transport Layer Security (DTLS), IPsec VPN client technologies, advanced clientless SSL VPN capabilities, and network-aware site-to-site VPN connectivity, enabling secure connections across public networks to mobile users, remote sites, contractors, and business partners. Costs associated with VPN deployment and operations are reduced by eliminating ancillary equipment required to scale and secure a VPN. The Cisco ASA 5500 Series SSL/IPsec VPN Edition provides advanced security for VPN deployments through its integrated network and endpoint security technologies. Securing the VPN is necessary to ensure it prevents network attacks such as worms, viruses, spyware, keyloggers, Trojan horses, rootkits, or hacking. Detailed application and access control policy helps ensure that individuals and groups of users have access only to the applications and network services to which they are entitled (Figure 2). Worms, viruses, application-embedded attacks, and application abuse are among the greatest security challenges in today's networks. Remote access and remote-office VPN connectivity are common points of entry for such threats due to limited security capabilities on VPN devices. VPNs are often deployed without proper inspection and threat mitigation applied at the tunnel termination point at the headquarters location, which allows malware from remote offices or users to infiltrate the network and spread. With the converged threat mitigation capabilities of the Cisco ASA 5500 Series, customers can detect malware and stop it before it enters the network interior. 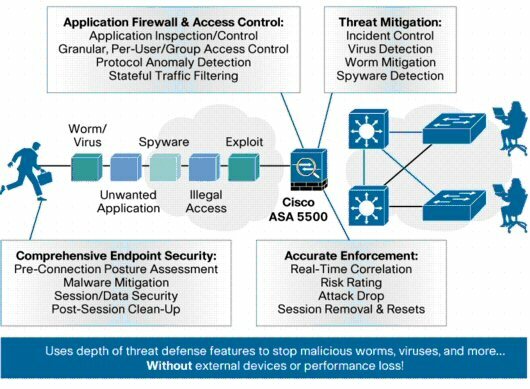 For application-embedded attacks, such as spyware or adware spread through file-sharing peer-to-peer networks, the Cisco ASA 5500 Series deeply examines application traffic to identify a dangerous payload and drops its contents before it reaches its target and causes damage. The table below lists some VPN gateway security features provided by the Cisco VPN Client. The Cisco ASA 5500 Series delivers site-specific scalability, from small offices to enterprise headquarter locations, through its five models: 5505, 5510, 5520, 5540, and 5550 (Figure 3). Models 5510 and up share a common chassis, built with a foundation of concurrent services scalability, investment protection, and future technology extensibility. The table below lists the specifications of the Cisco ASA 5500 Series models. Devices include a license for two SSL VPN users for evaluation and remote management purposes. The total concurrent IPsec and SSL (clientless and tunnel-based) VPN sessions may not exceed the maximum concurrent IPsec session count shown in the chart. The SSL VPN session number may also not exceed the number of licensed sessions on the device. 2Upgrade is available with Cisco ASA 5510 Security Plus license.